When we headed to San Francisco, a top place on our list of things to do has to be Lombard Street – also known as the famous ZigZag road in San Francisco. Starting at Hyde Street, this zig zagging road can be driven and walked down. We hopped on a sightseeing bus at Union Square and took the bus route to Larkin Street. From here, we walked up the steep street to the top of Lombard Street. Many photographs later, we found ourselves in a cute cafe a few blocks from the bottom of the famous street. Caffe Sapore offers fresh bakery items and very tasty bagels! This was a cafe for locals but everyone was very welcoming even if we did stick out as tourists! Sightseeing bus – As we mentioned above, we had a sightseeing pass for the few days we were in the city. We found this was the most convenient way for us to explore the city whilst we were short on time. To get to the Zig Zag Lombard Street, take the red route which will take you to the street – it will be the stop after Marina/Cow Hollow. Powell-Hyde cable car – This cable car route will take you to the top of Lombard Street, ready for you to take a descent down the famous crooked street. Drive it – Many people choose to drive down the Zig Zag Street in San Francisco – it can see up to 350 cars an hour during the summer months! If you want to join that statistic, set your Sat Nav to 1099 Lombard Street – the top of this one-way street. Just keep an eye out for tourists – they will be in your way as you reach the bottom! We enjoyed a leisurely walk down the Zig Zag Lombard street but we did notice a few fun alternatives that we will have to try when we are next in San Francisco! Segway – YES! You can get a segway down the Zig Zag street in San Francisco and it looked like great fun; just make sure you take it slow! GoCar – Rent a GoCar to tour San Francisco in style… well, kinda. 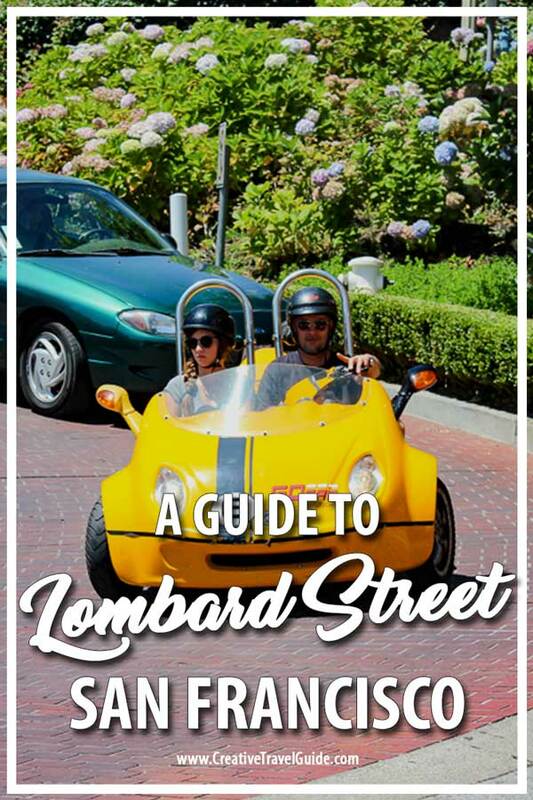 We saw a few of these cars zipping around the curved Lombard Street and you can rent one for the whole day; make sure you drive across Golden Gate Bridge too! Lombard Street is FREE and is open 24 hours a day. It can get busy during the holidays, especially if you wish to drive down the road. This famous Zig Zag road is still a residential area. Be respectful when visiting; especially at night. Avoid rush hour – those living on this famous street will also likely need to get to and from work. They won’t appreciate tourists standing on their driveway as they head off to work in the morning. Use the sidewalks – as I’ve mentioned, many, many tourists will drive down this road. It can get chaotic and busy, plus drivers are likely to be unsure of road rules themselves (for foreign tourists). Make sure you stick to the sidewalk and be extra cautious when crossing the street. Lombard Street was one of my favourite things to do in San Francisco because of its uniqueness but also its amazing views of the city from the top of the street! Have you been to San Fran? What do you think of Lombard Street? Let us know your thoughts in the comments below. Never been to San Fran but hope to visit one day – this looks awesome! 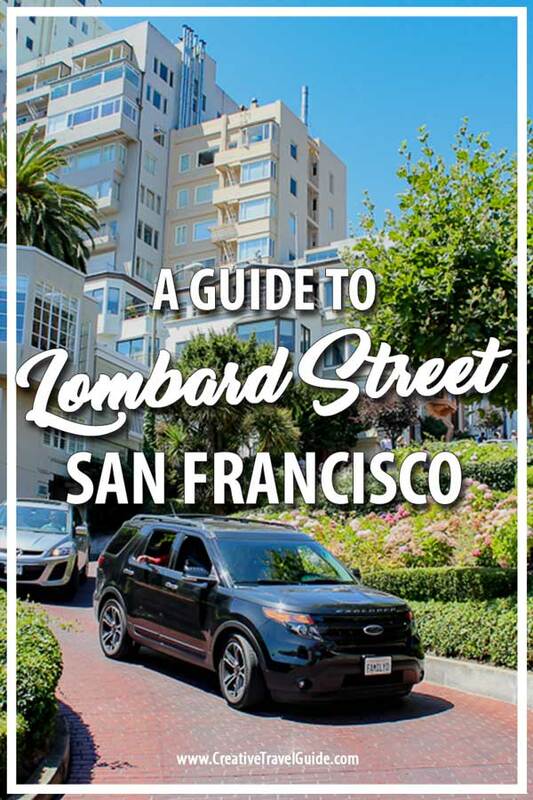 I don’t know much about Lombard Street – how long is the road? If I were to go to San Francisco, a visit to Lombard Street would be in my itinerary too. That looks so fun and the cafe you mentioned sound delightful. Wish you included photos of the cafe too! We love San Francisco and Lombard street. It’s a vibrant place with great views. That little yellow go car is too cute. I loved this street when I was in SF last year! We only got to spend a quick weekend in the city, but I’d love to spend more time there. I’d love to drive one of those Go cars! It’s funny – I grew up in the Bay Area yet I’ve never been to Lombard Street! I’m home for a while so I think I need to finally give this funny street a visit. Got to love that SF charm and architecture! Made it to San Francisco last year and loved seeing this – its one of the must sees there and it was great! What did you think of San Francisco? We loved the bridge and Alcatraz even though initially I hadn’t wanted to visit! Yeah this was one of the first places we wanted to see in San Fran! Alcatraz was haunting and the audio tour was fantastic! I loved San Francisco and definitely want to visit again! We drove this a few years ago while on a roadtrip thru California and it was such a highlight! Such a touristy adventure, but so unique! And that little yellow car, love it!! Super cool! I’ve been to SF a few times and I haven’t seen this. Thanks for sharing your beautiful pics!